Two facts: Without insects we had little to eat AND We spend huge sums to fight insect-borne diseases and crop pests. My interests are in two areas. In medical entomology, we are challenging urban myths about the biology and health consequences of bedbugs. In cultural entomology we reconstructed the population dynamics of bedbugs over the last hundred years from how well people can recognise bedbugs, from the appearance of bedbugs in fiction and from museum collections. We also use biology to augment historical information. 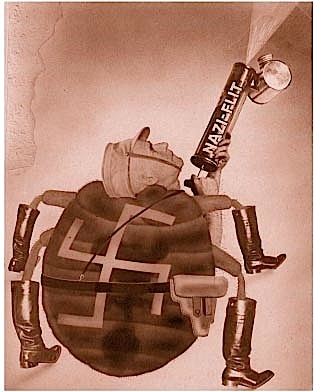 The research protocols of the Entomological Institute of the Waffen-SS at Dachau showed that Nazi-Germany carried out offensive warfare research. This work was intensely covered by the popular press. Picture left: Photomontage by John Heartfield. The cultural and natural history of the bedbug is covered in the book Literarische Wanzen. Antje is currently exploring the connotation of bedbugs in the German-speaking fiction literature in the twentieth century. Other aspects of our historical, medical and cultural research on the bedbug are largely covered under Insects and Man on this website. Finally, here is the not so atypical career of an East German entomologist and early evolutionary ecologist, Günter Köhler from Jena. BEDBUG – A history of the bedbug, written by a zoologist (link) in ReaktionBooks prestigious Animals series. HOPI BUGS – Native Americans DID have a name for bedbugs. However, it turns out they were not bedbugs but eagle parasites. Paper here. BUGGING FORECAST – See here that only 12 per cent of Germans recognise a bedbug, and most did the wrong thing, if they had them. REPETITION DOES NOT MAKE THINGS TRUE. At least not when it comes to bedbugs. Here. INSECT RESEARCH AT THE CONCENTRATION CAMP IN DACHAU reported here. THE TRUTH ABOUT BEDBUG BITES – is here. LITERARISCHE WANZEN – a fiction book by a zoologist (youtube link).